Anyone who saw the recent BBC series 'The Men Who Made Us Fat' may have been shocked to learn of the impact that sugar has had on our diets and waistlines - now it seems that 'impact' hits our pelvic floor muscles too. 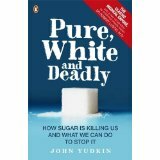 Following on from the series I ordered the book Pure, White and Deadly by British Scientist John Yudkin - it makes sober reading. Back in 1972 he warned that sugar was bad for our health - he was ignored by the medical profession and the food industry. I'll say ignored - there could be a conspiracy theory here that he was discredited and vilified by the food industry wanting to push sugar, especially corn syrup but I shall leave that to others to contemplate. Sugar consumption has tripled since the Second World War. Could Sugar be to Blame for the Epidemic of Prolapse and Pelvic Floor Problems? You bet it can! Excess weight means you have a higher risk of suffering from high blood pressure, gallstones, type 2 diabetes, high cholesterol & triglycerides, stroke and coronary artery disease. However that excess weight also takes its toll on your pelvic floor by overloading it and potentially weakening it so much that pelvic organs such as your bladder,uterus and bowel fall out of position. This is what's known as prolapse - and 50% of women will suffer prolapse by the time they are 55. Yes, That's Excess Weight - But You Can't Directly Blame Sugar for This Can You? When we consume sugar the molecules bond onto fats and proteins in a process known as glycation. Glycation forms end products (known as AGEs), which cause protein fibres, collagen and elastin fibres to become stiff and malformed resulting in connective-tissue damage. So basically the 'good' proteins in our skin and muscles that keep our skin and muscles springy and supple are attacked by sugar (and sugar products) so they become weak and less supple. Sugar not only gives us facial wrinkles, it wrinkles our pelvic floor too - it takes the elasticity out of muscle fibres and ligaments of the pelvic floor leaving it brittle and prone to prolapse and incontinence. So, think of your facial wrinkles and your pelvic floor next time you consume sugar, because as John Yudkin said back in 1972 'Sugar is killing us' and he may well be right.